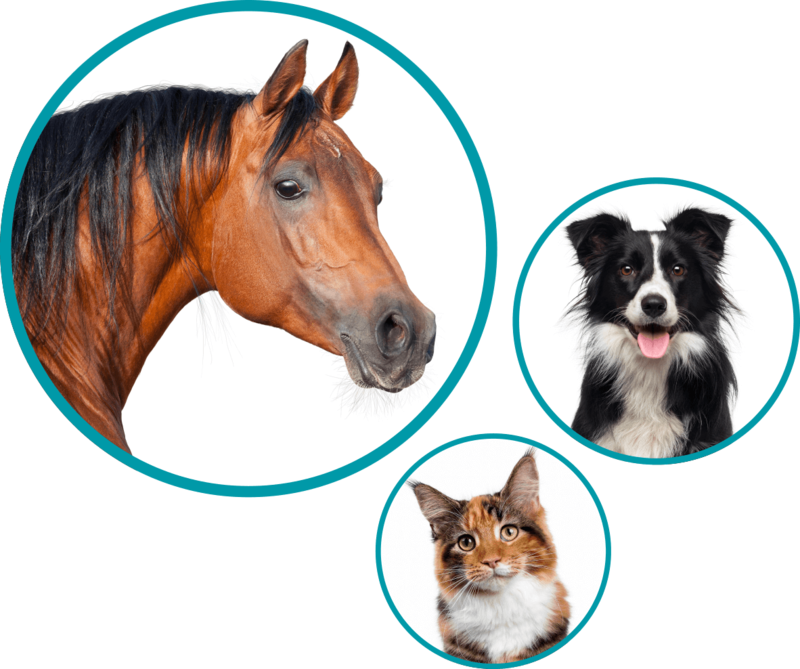 Wound and skin care treatment for horses and pets. Advanced bioactive borated glass technology for superior wound care. Use on cuts, abrasions, hot spots or sores. 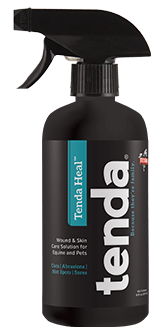 Tenda Heal borate-based, bioactive glass, administered as nanofiber, provides a hemostatic, antimicrobial, antifungal scaffolding which biologically stimulates the body’s natural healing process. 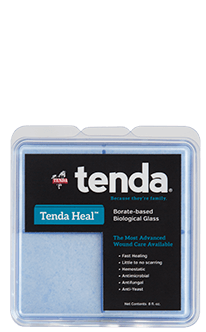 Tenda Heal™ is based on a platform of bioactive glass technology. Bioactive glass is a biocompatible, and resorbable material that bonds directly to living tissue, acting as a scaffold for cells to build tissues. As the glass degrades, ions such as calcium, copper, zinc, and boron release. These ions are critical to many biological reactions in tissue repair. Bioactive glasses are also beneficial for controlling pathogens. Contact us with any comments or questions you have regarding this breakthrough in wound healing technology. Tenda, which has been serving the performance horse industry for more than 45 years, has announced it will debut its state-of-the art, bioactive glass wound treatment, Tenda Heal™, at the American Association of Equine Practitioners Annual Convention and Trade Show in San Francisco Dec. 1 – 5. The use of bioactive glass in Tenda Heal’s microfiber application has proven to expedite wound healing in the most acute and difficult cases in humans and animals. Tenda Heal’s antimicrobial, hemostatic, fibrous properties stimulate the body’s natural healing abilities, which accelerate restorative tissue growth, resulting in a more rapid healing process. Tenda Heal, applied directly to the wound, quickly reacts with the body’s fluids, releasing elements that stimulate the generation of new blood vessels. This improves the blood supply to the wound, allowing the body’s normal healing process to take over. As the wound heals, the microfiber is absorbed into the body and does not have to be removed. In most cases, little to no scarring occurs. Co-inventor for the bioactive glass technology, Steven Jung, PhD, will speak about this advanced technology Monday, Dec. 3, at 11:45 a.m. in the AAEP Exhibit Hall at Theater 2. Attendees are also encouraged to visit Booth 2504 to learn more about Tenda and Tenda Heal™. Information is also available by calling 888-836-3213 or visiting TendaHeal.com or TendaHorse.com. 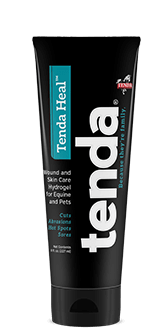 Tenda Heal state-of-the-art wound treatment contains hemostatic, antimicrobial, antifungal borate-based bioactive glass, which biologically stimulates the body’s natural healing process. Available in three formulas—nanofiber, spray and gel—to advance healing of wounds of varying degrees.